Being a new dental office in town, we want you to get to know who we are and what our mission is. Check out the top ten reasons we believe you will love OFD! 10. Number ten is the vision Dr. O has for himself and his staff of God first, family second and business third. Dr. O believes with God in the center, the rest will follow. 9. Number nine is community service. Dr. O has made it his mission to serve his community and give back through mission tripes, both locally and internationally. Dr. O volunteers his time and skills throughout the year by teaching others and providing services to those in need. He encourages his staff to do the same. 8. Number eight is location. 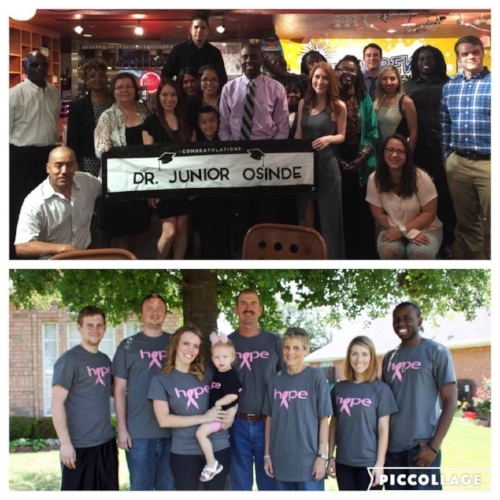 Osinde Family Dentistry is located conveniently in the heart of Terrell, TX. We are just 35 miles from Dallas and within 30 minutes of places like Rockwall, Wills Point and Canton! 7. Number seven is our technology. OFD is equipped with the latest technology to ensure your dental visits are both thorough and efficient. OFD offers new x-ray technology, which provides 3D images to help better diagnosis and treat patients. We also use digital impressions -- no more gooey impressions! 6. Number six is education. Dr. Osinde graduated from UNT with a degree in Biology. He was an honors college graduate and earned his undergraduate degree in just three years! He attended dental school at Baylor College of dentistry where he excelled in course work and clinic. He is now serving as a part time professor at Baylor College of Dentistry! You can be confident in Dr. O's skill level and knowledge. 5. Number five is his staff. OFD knows that your first impression at a dental visit is heavily impacted by your interactions with our team. We work hard to make sure that each staff member shares the vision and mission of OFD. 4. Number four is our relaxing environment. Our goal at OFD is to make your dental visit as enjoyable as possible. It all starts when you walk in the front door and are greeted by our team. Our reception area is not styled as a "waiting room" but more of a living room. We have comfortable furniture, good books and encouraging music. 3. Number three is our exam rooms. You will feel comfortable stepping into our rooms with comfortable seating and overhead televisions. You can watch TV while getting your dental work done! 2. Number two is community involvement. OFD strives to be involved in the community by being active with local events. Dr. O is a member of the Terrell Kiwanis Club and the Chamber of Commerce. He is also a coach for Terrell Youth Athletes little league football. He has been honored to speak at Southwestern Christian College and has even been able to go into the schools to provide dental education. 1. Number one is that we are accepting NEW PATIENTS! Walk-in and emergency patients are welcome, as well. We see patients of all ages! The team at OFD cannot wait to serve you and your family! What is the most important part about a dental visit to you? !